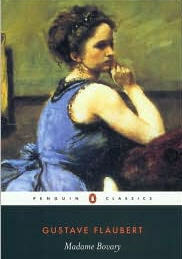 The June selection for my book group is Madame Bovary, by Gustave Flaubert. It’s the story of Emma and Charles Bovary and Emma’s adulterous affair with Rodolphe. Very controversial for its time (mid-nineteenth century). Although Charles could be considered a good man, Emma finds him extremely dull and oblivious to her wants or needs. She spends her days dreaming of a different life, one without Charles. For awhile, the birth of her daughter keeps her occupied, but she never bonds with the child and finds the child to be a sore reminder of her failed marriage to Charles. In comes Rodolphe. To Emma, Rodolphe is everything that Charles is not. We see Rodolphe completely taken with Emma’s beauty, yet when Emma has decided that she is ready to leave her bourgeois life, including her own daughter, Rodolphe has a change of heart. Although Emma’s character is a bit flighty and exceedingly dramatic at times, the reader can relate to her everyday struggles of being married to an “ordinary” man and always wanting more. I think the translation of the book is important as the copy that I picked up did not flow as well as I believe it should have, but I am chalking that up entirely to the translation. Overall I enjoyed the book, but I found myself skimming quite a bit towards the end. I am anxious to see what my book group says about it. Previous PostMore Summer ReadingNext PostWeekend Plans: Carrie Here I Come!